BNZ Materials, Inc., USA insulating fire brick plant, is the global supplier manufacturing what were originally known as JM insulating brick. Since the purchase of the insulation brick plant, the JM insulation brick are now called BNZ insulating brick. The same high quality IFB are produced at the original JM plant. Most other companies claiming to have JM insulating brick (imports) are using the JM trade name only, not the manufacturing process. Don’t be fooled. The PA Series of insulating fire brick (IFB) adds a lower cost alternative to BNZ’s traditional line of IFB. The PA series is designed for applications where the lower density and finer texture of the standard BNZ grades is not required. They meet or exceed the specifications of ASTM C 155 for each listed grade, and are produced under BNZ’s certified ISO 9001 Quality System. Strong. The high compressive strength of IFB allows for self-supporting structures at elevated temperatures. IFB are compatible with dense fire brick, and add strength to the whole construction. Low Heat Storage. Lower heat storage versus dense brick means reduced fuel costs and faster heat-ups in cyclically operated heating equipment. High Purity. BNZ IFB are low in impurities such as iron, which can adversely affect refractory performance in many applications. They are used in many furnaces with controlled atmospheres. Accurate Dimensions. 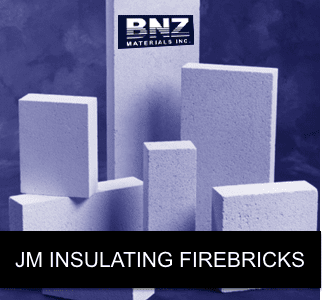 Because BNZ Insulating Fire Brick are machined to precise dimensions, courses can be laid quickly and easily, and the result is a stronger, tighter refractory lining resulting in less heat loss through the joints. Most BNZ IFB are available in Zelie Jumbo™ series, which require no mortar joints to produce sizes up to 24″ x 9″ x 3″. No longer are there design limitations caused by traditional standard brick shapes and sizes. The nominal cost of Zelie Jumbo sizes is more than offset by the elimination of many mortar joints and significant labor savings. will have fewer joints than shapes made from any other IFB manufacturer. and chord cuts are easily fabricated in any quality IFB. grade to use for your application. The hot load deformation along with the mean temperature (i.e. the temperature at the midpoint of the brick) should be considered as well, to assure a successful application. Consult your BNZ representative for recommendations on the best combination of products for your temperature, processing and atmospheric conditions. that makes them uniquely suited for laying porous IFB. Consult your local BNZ representative for the proper mortar for your application. JM 20 is BNZ-20 has the low density to meet the criterion for ASTM Grade 20. Its low reheat shrinkage meets the ASTM Grade 23 criterion. JM 23 is BNZ-23 is the traditional 2300° IFB manufactured by BNZ. It has a history for excellent service in suspended arch designs under cycling conditions. JM 23 HS is BNZ-23 HS is a high strength ASTM 23 Grade for applications where a stronger brick than the traditional 23 is required. JM 23 is BNZ-23 A is a slightly lower density, higher strength version of the BNZ 2300 IFB which can be used in any application where a lower density IFB may be needed. JM26 is BNZ-26 is the standard ASTM Grade 26. JM 26-60 is BNZ-26-60 meets all requirements of an ASTM C 155 class 26 IFB, with a higher alumina content than the standard BNZ-26 IFB. This makes the BNZ- 26-60 specially designed for areas where furnace atmospheres require the chemical inertness of a higher alumina product. These include the exposed lining of ceramic kilns and special atmosphere furnaces. JM 28 is BNZ-28 is the traditional ASTM Grade 28.
tolerate excursions above normal operating temperatures in applications such as strip annealing furnaces. JM 32 is BNZ-32 is a reasonably priced alternative to bubble alumina brick in many high temperature applications or where high alumina content is required. The Zelie Jumbo sizes are especially useful as spanner brick over burner tile. to 2300°F. It is normally specified in load bearing applications. BNZ-25 has been improved with higher strength. Its 2500°F rating fills the gap above 2300°F without the cost of high temperature brick. can still be made to order on special request. The physical and chemical properties of BNZ’s Insulating Fire Brick represent values obtained in accordance with accepted test methods and are subject to normal manufacturing variations. They are supplied as a technical service and are subject to change without notice. Results should not be used for specification purposes.